Ranger Communications once again sets the performance and reliability standard for entry level amateur mobile transceivers with the latest generation of our popular RCI-2950/70 series of cost effective, multi mode, high performance transceivers. Introducing the new RCI-2950DX & RCI-2970DX. These new DX models feature microprocessor control of not one but two amateur bands. The new RCI-2950DX, rated at 25W PEP and the RCI-2970DX, rated at 150W PEP are perfect for the recent band openings on 10 and 12 meters. 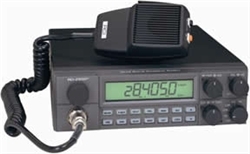 Now you can upgrade your mobile Ham capabilities with a radio that is rich in features and reasonable in cost. The new DX models have retained the operating features of its popular predecessors, including programmable repeater offset and capabilities for a CTCSS tone option — great for increasing repeater activity on 10 meters — and receiver scanning for quick search of active frequencies. The units offer three methods of frequency selection, non-volatile memory to store and scan up to ten favorite frequencies, and front panel frequency selector lockout. In addition, the DX Series offers an impressive array of design and performance improvements. What's different in the 2950DX from older 2950? Frequency range now 12-10 meters.